League of Angels - Fire Raiders new update is coming soon, bringing new hero “Blade Spiral”. Let's take a sneak peek! As the smoke lifted from the battlefield, a beautiful figure appears. With a righteousness that inspires the masses, she leads her soldiers valiantly. She is Blade Spiral – the Commander of the Kingdom's Knights, this strong and beautiful hero is admired by all the soldiers. She has a calm demeanor, making her a superb commander and invaluable in the war against the Demon King. Spiral Storm: Blade Spiral's weapon is thrown out and unleashes a devastating energy attack to damage all enemies with a chance to stun for 2 rounds. Whirling Blade: Blade Spiral enchants her weapon with Wind magic and strikes 2 enemies with the highest ATK while reducing their ATK for 2 rounds. 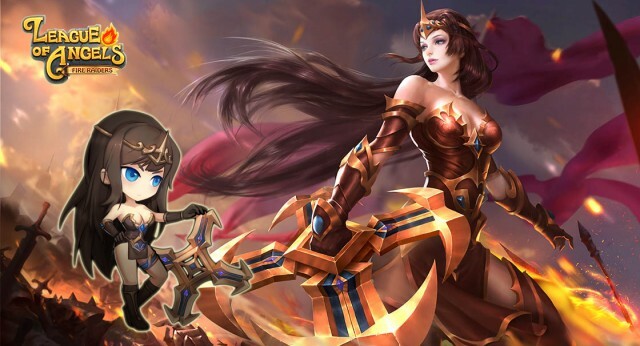 Battle Valor: Blade Spiral's valor increases damage reduction of the team for 1 round, and she becomes immune to next attack(s). Divine Favor: Infuse the blade with holy light to damage and stun a verticle column of enemies for 1 round. Battle Mistress: Blade Spiral gains increased HP, physical defense, and agility. What you guys think about this new Angel and new hero? Tell us on our Facebook fan page, and prepare for the update by saving your game progress to your GTArcade/Facebook/Google+/Game now! We’ll keep you updated when the new version 3.8 is available on Google Play and App Store.